One of my favorite things to eat is poke (pronounced poʊˈkeɪ/). 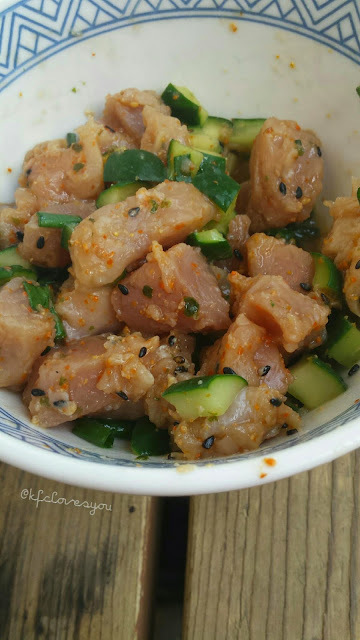 Poke is a Hawaiian dish (kind of like an appetizers) that is a raw salad usually made with sashimi Ahi Tuna aka Yellowfin Tuna. It comes either spicy, or with no spice and can be sweetend too. It is usually made with soy sauce, sesame oil, inamona, chopped chili peppers, ogo seaweed and maybe a few tweaks here and there. I don't think I can pin point exactly how the original recipe is supposed to be like since there are many variations and they all are pretty tasty. For my recipe, I used Albacore tuna, which is more of a white meat tuna. 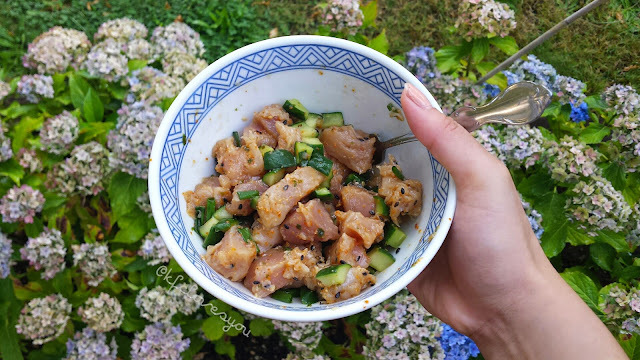 Below are the ingredients and instructions on how I made my poke! 1) Chop tuna into small, bite- sized cubes around 1/2 inch or so and chop cucumbers into cubes smaller than chopped tuna. Finely chop geren onions. 2) Place all chopped ingredients into a bowl and add your ponzu and sesame oil. Make sure you toss it well so everything is coated. For spice, proceed to add the togarashi and mix well. You can then add your sea salt at this point, sprinkling a little at a time. You won't need much. And that's it! Super simple and quick and healthy. You can either eat right away or cover the bowl with saran wrap and place it in the fridge to let the flavors soak in more. Either way, this dish will taste good. I personally like eating it by itself, but you can eat it over rice as well or even over a bed of arugula. Readers, have you ever tried poke? If you are a fan of tuna sashimi/sushi (raw fish) you should definitely give this a try. What are your favorite Hawaiian foods? Let me know!